What comes with the Gesture Wash 102? Does the GestureWash 102 have DMX capability? How do I setup the Sound-Active mode? How do I setup the Sound-Active Sensitivity? How do I setup the Gesture Spot 102 with a DMX controller? What is the Power Link feature? Does the gesture Wash 102 have a limit for Pan & Tilt? Where can I find more information about DMX and lighting software? Yes, it does! The Gesture Spot 300 has the traditional DMX IN and DMX OUT jacks built in. This will allow you to use these lights with a qualified DMX controller, and with the proper DMX Cables. The GestureWash 102 does have a Slave mode. Connect a DMX cable from the DMXoutput on the DMX controller that you are using, and attach it to the DMX input on the Gesture Spot 300. Below is a picture showing this. DMX-512 (Digital MultipleX-512 channels), as the name implies, can put control for up to 512 functions (the brightness of a dimmer, the mirror pan or tilt of a scanner, etc.) on one circuit (the daisy-chain from device-to-device). All of the devices on the same circuit out of a controller are referred to as a "universe." Many of the bigger, usually PC-based, controllers have outputs for more than one universe to allow control of more than 512 functions. Because DMX-512 is designed to have only one controller, a second controller would require a second universe, even if you need fewer than 512 channels total. The Powerlink feature lets you link multiple Marq Lighting Gesture Wash 102 moving heads together with power cables (IEC cables). One reason to do this may be if you have a shortage of wall outlets or power supplies to plug multiple units into. You can then power all of them when having just one Marq Lighting GestureWash 102 connected to a wall outlet. On the opposite power plug on the Marq Lighting Gesture Wash 102, you will see a power jack that works the opposite way. On this jack plug the opposite end of an IEC cable here. Now plug the other end of the power cable into the power jack of another Marq Lighting GestureWash 102. This will supply power to the Marq Lighting GestureWash 102. 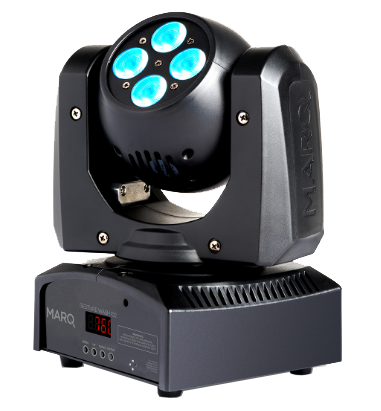 The Marq Lighting Gesture Wash 102 has a 38.5-degree beam angle on both sides of the fixture.